The other day I was scrolling around Buzzfeed and found a collection of crock pot recipes. I rarely make any of those recipes, but one stuck out to me. It’s from fellow blogger Tieghan Gerard, and her blog Half Baked Harvest. Her recipe for Crockpot Italian Chicken and Broccoli Rabe Chili sounded like the perfect thing to have cooking away while attempting to brave the last few frozen months of winter on the Northern Plains. I did substitute chopped kale for the broccoli rabe, but only because I eat kale salads often during the week so it just fit better with my regular food routine. Her recipe was perfect! I baked up some dinner rolls, and tucked in on the couch with Scout for some Netflix and way too much food. It’s healthy, but it’s flavorful and spicy enough that you don’t mind that its healthy. Plus, that’s just an excuse to eat more, and on cold winter nights that’s what you need!! I will defiantly being going back and digging through the archives on Half Baked Harvest to find other yummy treasures! In totally unrelated news, my poor little MacBook did indeed die last Friday night. According to the repair dude, it had a major hard drive malfunction. So, needless to say, I’ve been heming and hawing all week about whether to keep the brand new MacBook I bought on sale at Best Buy, or repair my old one for about half as much. Side note…..apparently being a mid-2009 model number makes my MacBook vintage…or so I was told!!! I did eventually settle for fixing the old one. So the Mac is getting a new battery and a fancy new hard drive, and they promise me that I’ll end up with basically a brand new computer in my old case. The downfall of this, is that because the old hard drive crashed so hard, they aren’t able to get any of my old photos and documents back. Let this be a lesson to you kiddos……always use your Cloud Drive! I have plans, tons of plans! Often, they are super unrealistic but I feel like its always good to have goals for things. Seems totally realistic to buy a Harley even though the last time I tried to be in charge of a bike I hit a hay bale and tipped over……..yea……that happened. Saturday morning I made a plan to steal a ’74 Trans Am….seems totally legit to me. Just need to find out the garage code and we are good to go! Today marks the beginning of the end of a plan that in theory seemed great, but reality had other plans. 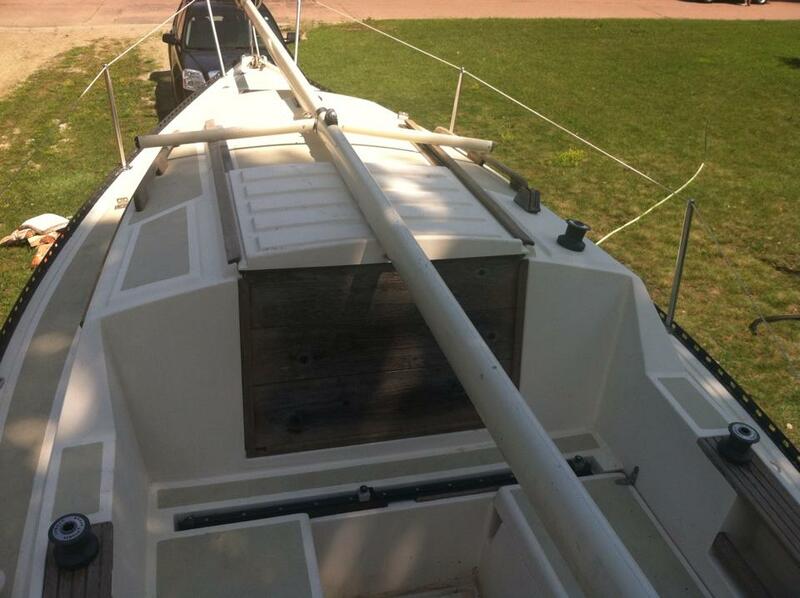 My Dad had bought a sailboat…I assume….before I was born. In any case, I don’t remember an existence pre-Sea Jet. That’s the name of the boat, the Sea Jet. Seems like an odd name for a boat that’s in no way large enough to be sea worthy, but it’s a play on our family initials. She’s a couple years older than I am, but she’s got a retractable keel, and that makes her a very rare girl indeed! She’s also, I think, one of the smallest sailboats you can find with a sleeper cabin. You could go drop anchor in the middle of the lake and live on her for the weekend if you want. We never spent much time out on the boat, life just got too busy. The Jet mostly hung out back behind my Grandpa’s house taking Mother Nature’s abuse. 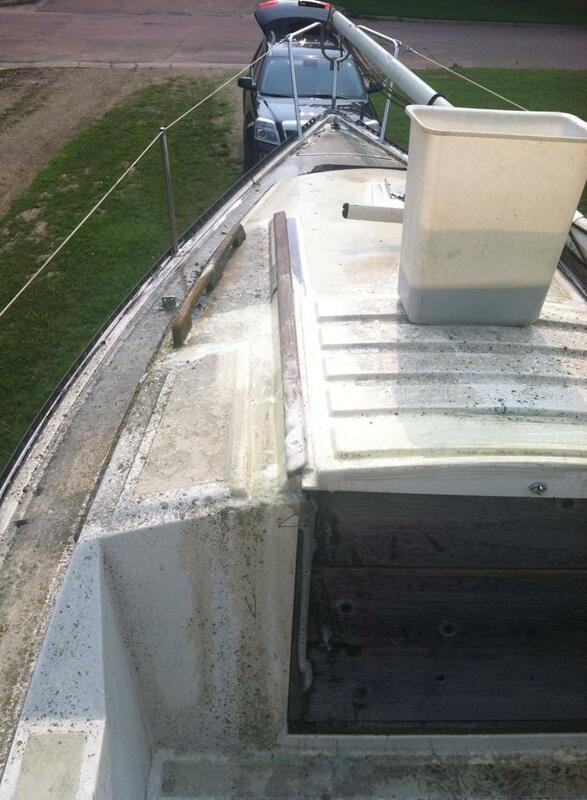 When I was in high school, Dad and I did get it all cleaned up and launched out in the marina for the summer. It was a good summer, and I was a big fan of scampering around the deck barefooted whist trying to learn how to sail. I never really did learn how to sail, this was a minor flaw in my sailing plans, but that’s what Google is for right?!?! After Dad died, I wanted the Jet to be my project. I was going to get her all cleaned up and redone. She was going to get new vinyl decals (blue instead of the 80’s brown she’s currently rocking), new cushions and curtains in the cabin, and new riggings all around. I decided on redoing everything in blue because Dad had blue eyes and I thought that would be a nice touch. Plus…..I mean the cushions are orange…..ORANGE PEOPLE!! I just couldn’t leave them like that! The inside is also rocking some sorta orangey tinted wood….nothing a coat or two of white paint wouldn’t help perk up! Can’t say the years had been particularly nice to my Jet…. Lichen, or as I prefer to call them “Nature’s Slip ‘n Slide”, are no match for my muscles and some Dawn! Alas, sailing isn’t really a middle class, single, white girl’s hobby. Marina fees for the season alone are much more than I can afford, and the Jet does need new riggings before she’d be lake worthy. I’m not sure how much the rigging would cost me, but I’m betting it’s not in the budget. I haven’t had the heart to un-bag the sails, they look like they are fine, but if they aren’t that would be a huge expense. Beyond the financial issue comes transport and storage. I’m not sure my Terrain has the muscle to haul her, and I have a hard time shelling out the funds to spiff her all up if I’m just going to have to leave her outside in the weather as always. Plus, Grandpa’s house is no longer available for free storage, so that’s a whole issue as well. Long story short, we have to sell the boat. I think this is the first project in my life that I’ve had in my hands and had to give up on. I don’t often bite off more than I can chew, although I do love to dream big. 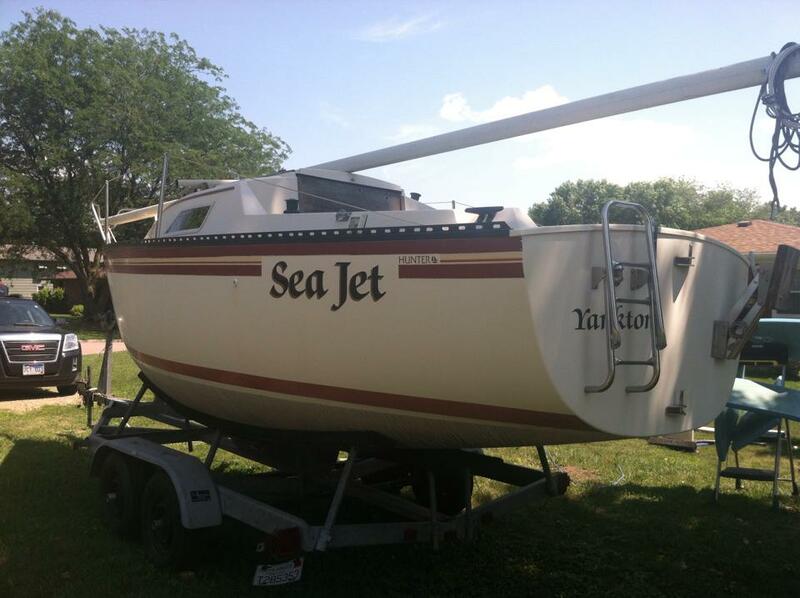 So I spent the day scrubbing the years off the Sea Jet and getting her ready for the “For Sale” signs. Hopefully, she’ll catch someone’s attention and they can take her out to the lake where she belongs. Realistically, I’ve done most of the hard manual labor for them now anyway! Check the sweet 80’s vintage vinyl! I spent most of the winter ignoring the projects and updates I want to be performing to my house. Spring and Summer mean a new start and a renewed sense of purpose for my projects. (I feel like that sentence was about as cheesy as they come.) Plus, I have some friends who are getting antsy to help with my projects, and you should never let the offer to help paint a room expire! I’ve never really been in charge of picking out my own paint colors, just another step in adulthood, so I’m having some anxiety about making such a big choice. I thought maybe I would throw up some options on the blog. It might help me to talk through everything, and maybe I’ll get some good ideas in the comment section. That’s right people, this is going to be an interactive post. TELL ME WHAT YOU THINK! I’ll make more Bedroom Changes posts as I get the room accomplished. Plus, there is a whole bedroom upstairs that I need to tackle, but I have a more streamlined vision for that room so I feel less stressed about that one. A clashing of styles…..my current situation. The people who lived here before me had really modern style. There was a white, ceramic moose head hanging over the bed……hahah totally not my taste!! The room is currently painted a dark blue/grey. 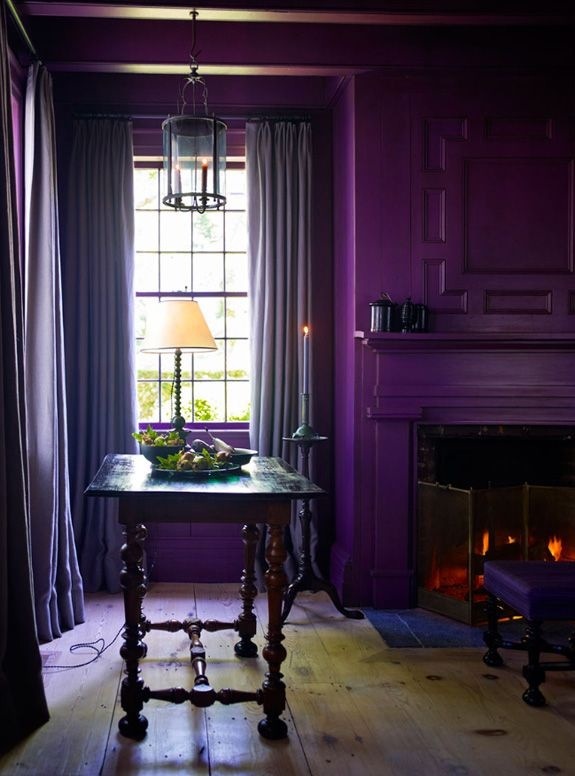 Actually, I like the color and will probably move it to the bedroom upstairs. The grey just doesn’t go with my sheets and curtains. The curtains are the same purple and gold damask as the bed skirt. I really like my purple and gold theme and the fabrics I have going, so now I just need to decide on a wall color. The current choices are a dark purple…..which is apparently tricky to find, or a beige. I’m hesitant about the beige because everyone can have beige walls….they just aren’t very exciting, and I’m sorta an exciting gal. The other issue is that the rest of my house is beige. In a way, it feels like taking the one exciting room I currently have, and dulling it back down to normal. 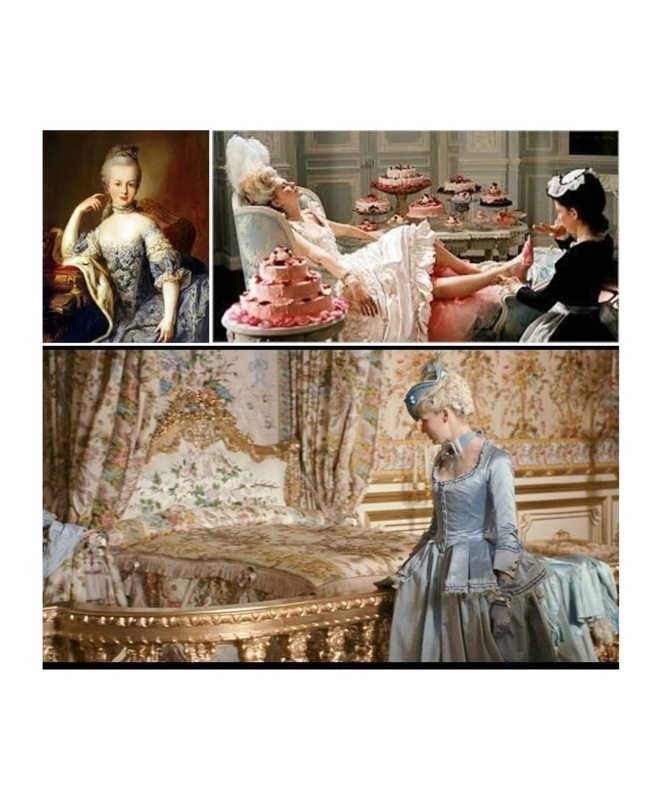 Marie Antoinette in all her opulent glory. 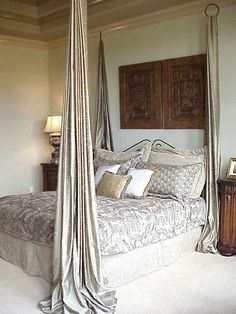 I want my bedroom to be a bit fancy and over done. I mean, obviously I’m not going to gold leaf everything, but I would like it to be a modern take on that classic style. The whole main floor of my house has sort of a classic style, and I want the bedroom to be the grandest room on the floor. I’m the queen of my own castle and I want my bedroom to show it. The stencil idea will be done for sure. Just the wall behind my headboard. 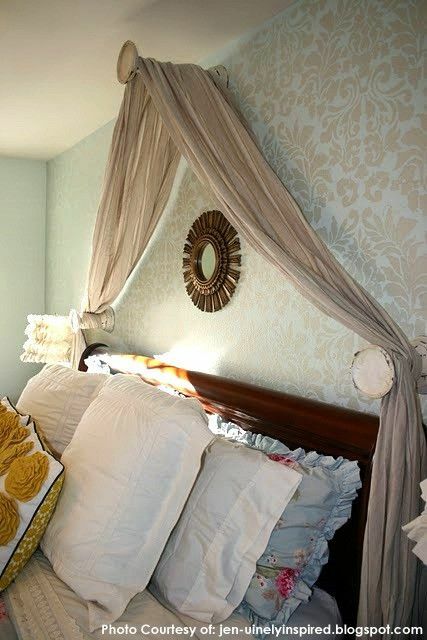 I’d also like to make a new, tufted headboard, but that’s a different blog post. It doesn’t matter if I paint the walls dark purple or beige, the typical paint finish we use is eggshell. I bought some metallic pearl paint for my couch, and that’s what I’ll use for the stencil. It will be fairly subtle either way, just a difference in finish. In my mind it looks cool, however I’ve realized that my mind’s vision sometimes doesn’t work out. I’m also really loving this look. I would be perfect for me because I’m obviously not rocking a 4 post bed frame. I don’t know that I would do all 4, and I have no idea what fabric I might use. Nothing I currently have. So, if you have suggestions on what mind go with the rest of my fabrics, that would be helpful. Isn’t interaction fun?!?! If I paint the walls dark, I will repaint my doors and woodwork a light cream. The only thing I’m not quite settled on is what to do with the ceiling. I do like the general idea of painting the ceiling and walls the same color with some nice trim in between, however there are two issues with this plan. 1. I don’t have the trim currently, and budgetary restrictions might cause my room to look a bit odd for awhile as I save. 2. My ceiling and walls do not have the same texture. I realize that this can be fixed, but that’s maybe more work than I’m wanting to bite off. I think that unless I change the ceiling texture to match the walls it would be odd for them to be the same color. The other slight problem I’m having with purple is the horrific problem that can occur when you pick the wrong shade! 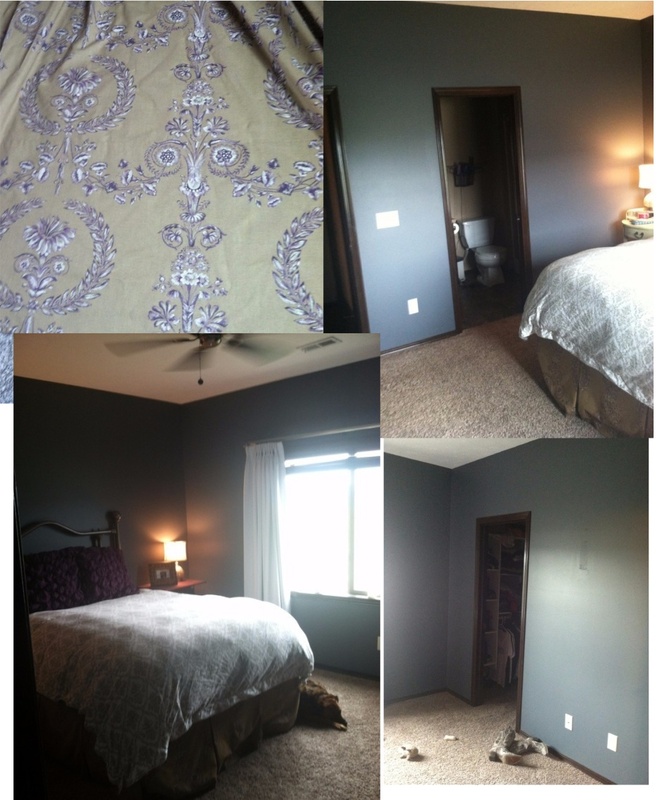 The caption on this photo was, “Purple done right!” WRONG….THERE IS NOTHING GOOD ABOUT JOLLY RANCHER GRAPE WALLS! I mean….the bad can get really bad! 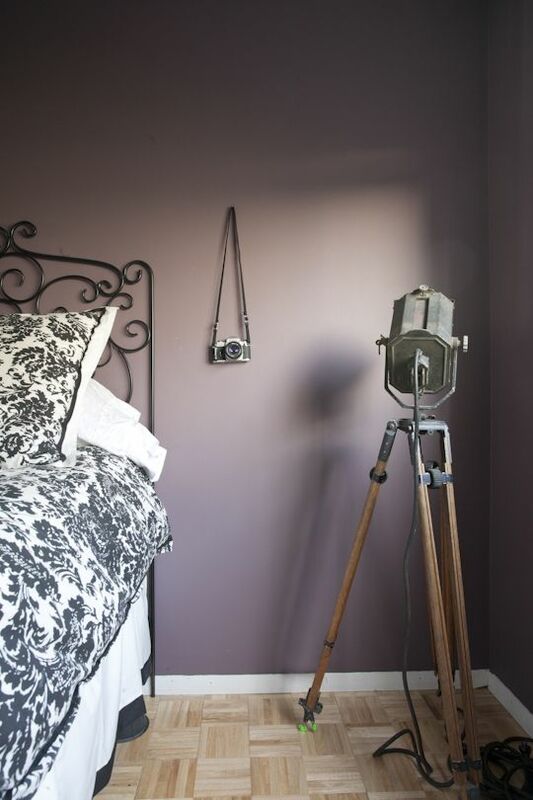 So, this is my conundrum, hunt around for the perfect dark, purple befitting royalty….or settle for some beige, and try to fancy it up a bit by painting the nightstand, and maybe a mirror, dark purple. Leave some comments and help be decide. I’m thoroughly on the struggle bus with this choice and I need your help! Also, the bedroom is attached to the bathroom which I may or may not paint. 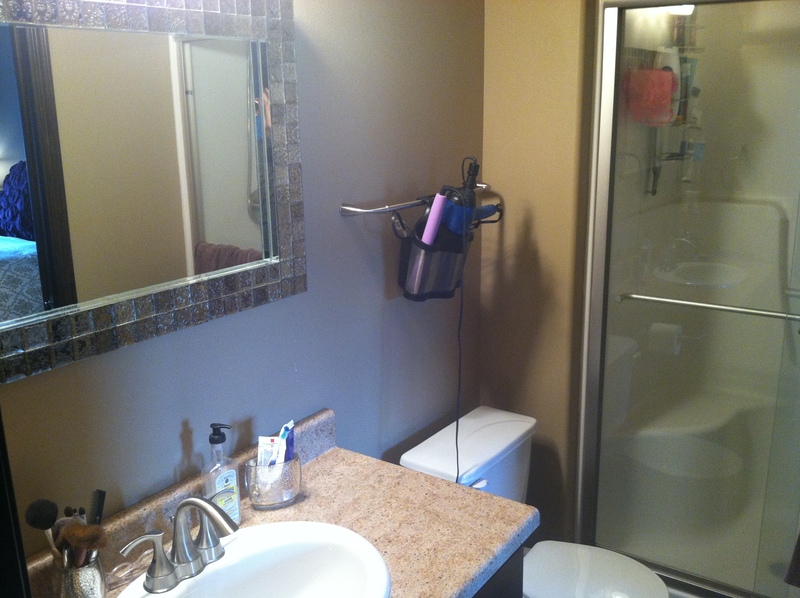 However, the bathroom has silver fixtures, and it’s not in my budget to change them. I’m not a huge fan of gold hardware, and so the silver will probably be permanent.